Mysuru: In one of the largest events of its kind in city, a large number of children from different schools in city participated in the Drawing and Painting Contest, organised on the last day of Star of Mysore Education Fair at Maharaja’s College Grounds here yesterday which was held in an atmosphere filled with extreme enthusiasm. Hundreds of students from classes KG to X took part in the competition that was conducted in three categories: 4 to 8 years, 9 to 12 years and 13 to 18 years. The competition was also held for parents. 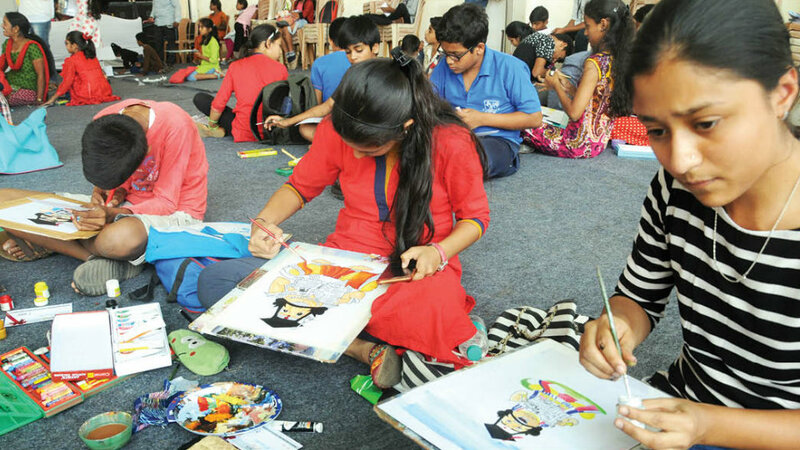 While the students between 6 and 8 years drew cartoons and filled colours, others used their imagination to create wonderful drawings and paintings which was held from 12.30 pm to 1.30. Drawing sheets were provided by the organisers and a time limit of one hour was given to the participants to complete their drawing and painting. While many students had registered themselves for the competition since two days, some others registered their names on the spot and took part in the competition with encouragement from their parents.